These days at MonkeyMedia Software, things are going well. Very well! We seem to be finally firing on ALL cylinders. It wasn’t always this way. No, not at all. You are catching me in my fifteenth year in the restaurant industry. So, I am thinking today, that just like everything, change is inevitable. It’s not going to stay like this. No way. Not a chance. So, I have to take the small moments to make sure I celebrate. Pay respect and homage to those who have been there to support me on the way. My restaurant industry beginnings! Today’s post is personal. Very personal. My ex-business partner at Tony’s Deli & Catering Company, just bought the business back from the man I sold it to about 7 years ago. You can see a photo of David below. David took over the deli on June 1, 2012. He has been calling me, like a kid in a candy store! He can’t sleep! “Erle, what have I done”, he asks me? That feeling of uncertainty. He wants to bring Tony’s into the future. 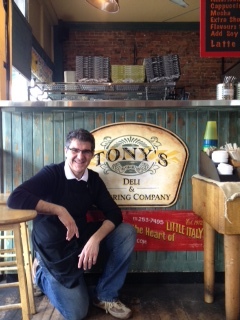 So, today I came to see David in his new venture at Tony’s. No wonder he can’t sleep! As I walked into the deli, seeing David behind the counter again, warmed my heart. He is so passionate about Tony’s and the food business. Awhile back, I wrote a post called “Ghosts in the Walls”. The idea of dreaming big, of entrepreneurial dreams that have been lost over the decades. David and I certainly dream BIG! We just can’t help it. We are made that way. Can you imagine a guy that buys back a business that he started, then left for 15 years and now comes back again? Well, only a guy with BIG dreams can do that kind of thing. He has a deep, deep belief system. Very deep. He doesn’t even consider the risk because his dream is so, so BIG. By the time we hit lunch time, we think we have the next iteration of Tony’s all figured out! Here’s what’s so AMAZING! At least for me. Read on. Prior to my visit with David today, I pulled up to the deli while on a cellphone call with one of the most important, generous and kind CEO’s that our industry has ever seen. And I am not kidding. I mean, why would such a successful man, go so far out of his way to help me. If not just because he is a man of “heart and soul.“He’s so fantastically smart, that he just knows the right questions to ask. And to say he is articulate, well, that would be an understatement. “PINCH ME! DID HE JUST ASK ME WHAT I THOUGH HE ASKED ME?”, I thought to myself. I have been thinking about this moment for the last 10 years. Watching, hoping, and thinking about it. On his behalf. After all, the front cover of the magazine does not talk back to you! Before March of this year, it was frustrating to talk to a magazine cover! My fire is burning so hot today! I am being asked by our industry’s brightest mind for MY perspective! Mom, are you listening? So, as I pulled my car over so I wouldn’t trip on my words, the clarity of my thoughts and intuition kicked in. I answered to the best of my ability. To my biggest dreams for him and his brand. It didn’t matter if I was wrong. All that mattered to me, in that moment was the human and intellectual connection that I was having with him. That he valued my opinion, is good enough. The scale and consideration of the conversation is the most exciting part of all. It’s not that the ideas are so unique, at least I don’t think so. It’s all about the application of the ideas. Not because of the profits to be made. No. It’s to do with shifting “public perception”. It’s to do with fixing the restaurant business in the long run. Setting the path for tomorrow. Figuring out where an industry needs to go. The future. The impact on consumers and the defining of a “new economic” model for our restaurant community! WOW! After all, as a community, anything we put our minds to ends up working. It’s the people that are so fantastic! People like David. People who change the world in the communities we live in. I love that part about our industry. We operate at a BIG business level with fantastic scale. But, we live at the community level. Good people, doing great things. 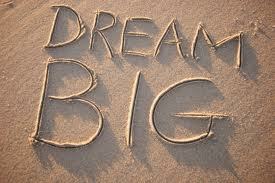 My dream is BIG! Perhaps too BIG? Could be. We won’t know for awhile, if I am lucky to still be standing! But it sure is fun to think about! The possibilities are HUGE! I am so lucky. So, as I sign off on this post, all I want to do is freeze this moment in time. Why? Because it is so fantastic. So amazing to be connecting at such an intellectual level. Debating the future, trying to make it better. Oh. And for any of my readers wondering what the BIG dream is? Just call David at Tony’s Deli & Catering Company. He’ll tell you all about it! All of a sudden, I am craving a Turkey Pesto Panini and a Capuccino!